, a man eminently learned in his day> and one of the revivers of literature, was born at Bristol in 1442, and educated at Winchester-school. He was elected thence to New college, Oxford, in 1467; and in 1479, presented by the warden and fellows to the rectory of Newton-Longville, in Buckinghamshire. But his residence being mostly at Oxford, the society of Magdalen college made him their divinity reader, about the beginning of Richard the Illd’s reign; and that king corning soon after to Oxford, he had the honour to hold a disputation before him, with which his majesty was so pleased, that he rewarded him graciously. 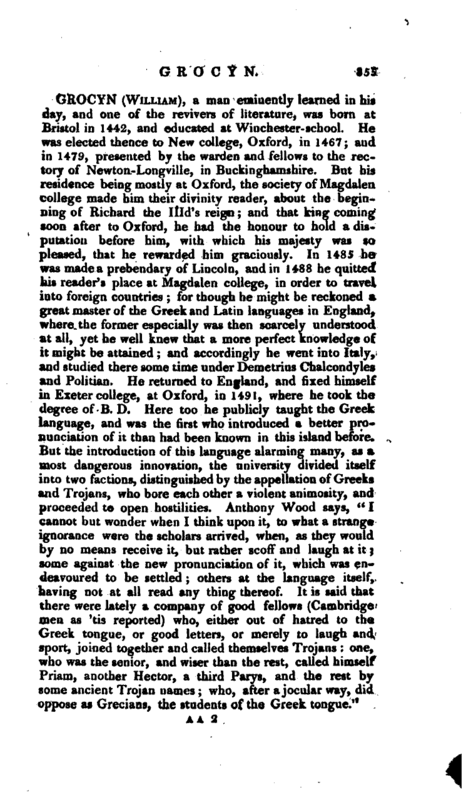 In 1485 he was made a prebendary of Lincoln, and in 1488 he quitted his reader’s place at Magdalen college, in order to travel into foreign countries; for though he might be reckoned a great master of the Greek and Lati languages in England, where the former especially was then scarcely understood at all, yet he well knew that a more perfect knowledge of it might be attained; and accordingly he went into Italy, and studied there some time under Demetrius Chalcondyles and Politian. He returned to England, and fixed himself in Exeter college, at Oxford, in 1491, where he took the degree of B. D. Here too he publicly taught the Greek language, and was the first who introduced a better pronunciation of it than had been known in this island before. But the introduction of this language alarming many, as a most dangerous innovation, the university divided itself into two factions/distinguished by the appellation of Greeks and Trojans, who bore each other a violent animosity, and proceeded to open hostilities. Anthony Wood says, “I cannot but wonder when I think upon it, to what a strange ignorance were the scholars arrived, when, as they would by no means receive it, but rather scoff and laugh at it; some against the new pronunciation of it, which was endeavoured to be settled; others at the language itself, having not at all read any thing thereof. It is said that there were lately a company of good fellows (Cambridge men as 'tis reported) who, either out of hatred to the Greek tongue, or good letters, or merely to laugh and sport, joined together and called themselves Trojans: one, who was the senior, and wiser than the rest, called himself Priam, another Hector, a third Parys, and the rest by some ancient Trojan names who, after a jocular way, did oppose aa Grecians, the students of the Greek tongue.” | In this situation Grocyn was, when Erasmus came ta Oxford; and if he was not this great man’s tutor, yet he certainly assisted him in attaining a more perfect knowledge of the Greek. He was, however, very friendly toErasmus, and did him many kind offices, as introducing him to archbishop Warham, &c. He also boarded him gratis in his house, although he was by no means in affluent circumstances. We cannot be surprized therefore that Erasmus speaks of him often in a strain which shews that he entertained the most sincere regard for him, as well as the highest opinion of his abilities, learning, and integrity. About 1590 he resigned his living, being then made master of Allhallows college, at Maidstone,in Kent, though he continued still to live mostly at Oxford. 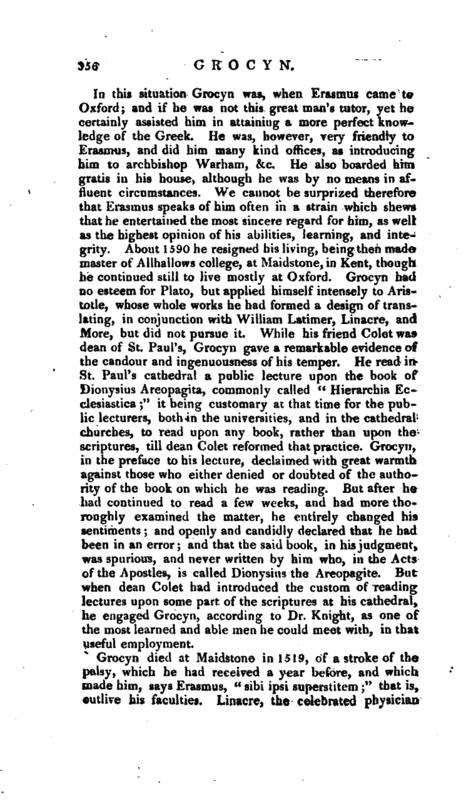 Grocyn had no esteem for Plato, but applied himself intensely to Aristotle, whose whole works he had formed a design of translating, in conjunction with William Latimer, Linacre, and More, but did not pursue it. While his friend Cotet was dean of St. Paul’s, Grocyn gave a remarkable evidence of the candour and ingenuousness of his temper. He read in St. Paul’s cathedral a public lecture upon the book of Dionysius Areopagita, commonly called “Hierarchia Ecclesiastica;” it being customary at that time for the public lecturers, both in the universities, and in the cathedral thurches, to read upon any book, rather than upon the scriptures, till dean Colet reformed that practice. 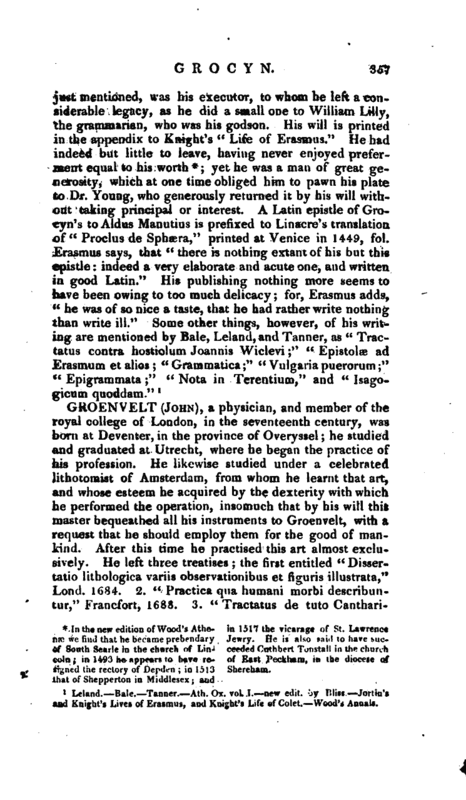 Grocyn, in the preface to his lecture, declaimed with great warmth against those who either denied or doubted of the authority of the book on which he was reading. But after he had continued to read a few weeks, and had more thoroughly examined the matter, he entirely changed hi sentiments; and openly and candidly declared that he had been in an error; and that the said book, in his judgment, was spurious, and never written by him who, in the Acts of the Apostles, is called Dionysius the Areopagite. But when dean Colet had introduced the custom of reading lectures upon some part of the scriptures at his cathedral, he engaged Grocyn, according to Dr. Knight, as one of the most learned and able men he could meet with, in that useful employment. In the new edition of Wood’s Athewe we find that he became prebendary of South Searle in the church of Lincoln; in 1493 he appears to have resigned the rectory of Depden in 1513 that of Shepperton in Middlesex; and in 1517 the vicarage of St. Lawrenc Jewry. He is also said to have succeeded Cathbert Tonstall in the church of East Peckham, in the diocese of Shereham.